The North Andover Auto School. Neşe Lortlar-Ünlü of Newton showed up early at the Registry of Motor Vehicles Watertown branch for her 9 a.m. road test appointment on a hot Wednesday in early September. Two hours later, she still hadn’t been tested. But not everyone had to wait: More than two dozen people who had paid a private driving school $100 in advance were tested one after another by a state examiner. Lortlar-Ünlü and another applicant – who both had managed more than a month earlier to secure one of the few open time slots that day – watched with increasing agitation. "They paid extra money to get (a road test) that day," said Lortlar-Ünlü, a Turkish doctor. "They did not have to wait like us." A cornerstone of Massachusetts law is equal access to public services. But the Registry of Motor Vehicles has interpreted that access in a way that favors people willing to pay extra. A form of pay-to-play for road tests has evolved in recent years, severely limiting the average citizen’s ability to secure coveted appointments in a timely manner, an examination by the New England Center for Investigative Reporting has found. Applicants can jump the line for road tests if they pay anywhere from $75 to $195 extra to a driving school – whether or not they took driving lessons from it. The price can include receiving weekend and early morning road test appointments unavailable to the general public and, sometimes, even a test appointment in an applicant’s hometown where there are no registry locations. "It’s troubling," said Peter Enrich, an expert in local and state government at the Northeastern University School of Law. This kind of service preference, he said, is similar to the fee air travelers can pay to the federal government for expedited access through airport security. But he said he didn’t know of any other similar privilege at the state level –especially through a private business. "It’s not just that I can pay the Registry to get to the head of the line, it’s the Registry is selling that right to a private business that is able to extract a profit from me for that access," Enrich said. The practice is not new in Massachusetts, but in the past it didn’t affect many people because it didn’t interfere with weekday appointments. Willing state examiners would earn overtime for testing blocks of driving school students during Registry off-hours. Yet road test applications across the state dramatically increased from about 3,500 per week to 4,500 in the past decade, state data shows. At the same time, budget woes sliced the number of road examiners by a third, to 39, although the Registry is hiring again. In addition to those pressures on available slots, the Registry now also offers some blocks of time to driving schools for their applicants during regular Registry hours – squeezing out members of the public who can’t, or won’t, pay anything more than the basic $35 road test cost. Among New England states, Connecticut and New Hampshire also allow off-hour road tests, but New Hampshire does not conduct them during regular registry hours. Contrary to the practice in Massachusetts, Connecticut’s Saturday appointments are only for the public, although a separately run program during regular hours caters to driving school applicants. Massachusetts Registry officials deny there is any inequity of access, saying customers can choose to book online, by phone, or pay a driving school. It "comes down to what the customer is most comfortable with to get their road test," said interim Registrar Erin Deveney. Still, Deveney said the agency is committed to shortening long wait times for road tests. Three new examiners have been hired, another is about to be, and four more positions have been posted. The agency is also doing a comprehensive customer service review. "If there is a reason to believe that something – anything – about this process is not working, we will take a deeper dive into it as part our top-to-bottom customer service review," Deveney said in a follow up email. Complaints of interminable wait times at the RMV to renew licenses, register cars and conduct other transactions are hardly new. On two occasions in September and October, there was about a 45-minute wait at the Watertown Registry just to get a number for the appropriate line to then have, for some, another several-hour wait to get to an RMV counter. Yet for better or worse, anyone who travels to a Registry endures those wait times equally; the only way to avoid them is to try the RMV phone or online service, but those, too, are available to virtually everyone. The Registry recently announced a new express line being instituted in some of its locations. "It’s privatizing the public system," said Greg Rundlett of Salisbury, who refused to pay a driving school $75 for a quicker road test time for his son this fall. Instead, he sat online for hours during two consecutive days. The only appointment he could find then was more than a month out in November in Pittsfield, 170 miles from home. He kept trying and now has an appointment closer to home. "(No one) should have to pay extra to get an appointment." When the Registry began Saturday and off-hour road tests more than two decades ago, it helped free up road test times for the general public. The auto schools would organize applicants efficiently – each using the same car with appropriate working lights and brakes, for instance. State police officers who conducted road tests starting in 1992 were able to test large numbers of students in short time frames, which left more weekday appointment for the general public. Over time, that program has expanded and grown. Today, weekend and off-hour road tests are offered throughout the state from Springfield to New Bedford. Driving schools pay the Registry $20 per applicant to fund the examiner’s overtime for conducting tests. The driving schools in turn charge varying additional fees for the use of a car and a required sponsor to sit in the back seat. Some require a driving lesson, as well, to book an off-hour road test. In 2008, a year after civilian registry examiners took over road test duties from the state police, the wait for a road test for the general public was, on average, two weeks, according to a Boston Globe report. In 2012, it was a five-week wait, according to the same article. Today it can be months, but an accurate wait time is impossible to ascertain because the Registry system only books 45 days out. "The sad impact is there were kids last summer who couldn’t get scheduled, went to college and now are hoping for December," said Dan Strollo, former president of the Professional Driver Education Association of Massachusetts and executive director of the Lexington-based In Control Family Foundation that teaches advanced crash prevention techniques. He said students get rusty with such long lag times. "We want these kids driving," he said. In the past five years, the driving school access program has dramatically expanded. 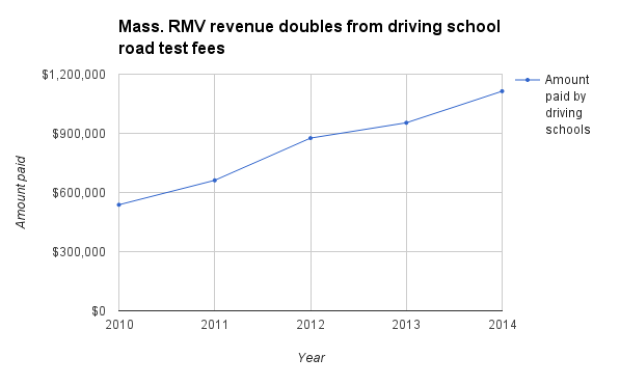 Registry data shows driving schools paid $537,720 to the Registry in 2010, representing 26,886 tests. In 2014, this amount had more than doubled to $1,113,640, representing 55,682 tests. That means about 25 percent of roughly 225,000 road tests in the state each year are done through driving schools. The agency was unable to provide numbers for how many of those take place during regular business hours, but insisted they only offer driving schools times during regular business hours if they have a free examiner and space allows. Yet driving school officials say their students are given preferred access. "I get Mondays," said Tim Cooney president of the Central Mass. Safety Council Auto School Inc., headquartered in West Boylston, one of the state’s biggest driving schools. Cooney used to only get examiners to come to his driving school on Saturdays, but the Registry cut back on some of those slots and began giving him Monday appointments about two or three years ago. He charges people who don't take his driving-school course $195 for those road test appointments. That cost includes the Registry fee, use of a car and sponsor, and a driving lesson. Even among driving schools, there is discontent, with smaller ones complaining of favoritism because they say they do not get access to road test examiners to test blocks of students as regularly as others. But other driving schools suggest the deciding factor is examiners’ willingness to work overtime and how close to a driving school he or she lives. "Because of our proximity to Lawrence (where there is a Registry) we seem to get a preference," said Michael Larocque, owner of the North Andover Auto School who has other locations where it is more challenging to lure an examiner. Growing increasingly agitated at the Registry in September, Neşe Lortlar-Ünlü kept quiet, but the friend of another applicant spoke up: Mary-Ann Knott-Craig went inside the Registry asking for a road test examiner. She asked others outside why driving school applicants were being tested ahead of her friend. At one point, Knott-Craig whipped out her phone and began video-recording the situation outside the Watertown Mall, where the RMV is located and road tests occur. She recorded one student who said he paid $100 that day for the test, leading her and Lortlar-Ünlü to assume he got on the road test list that day. The man had received a road test appointment several weeks earlier (examiners are given lists of names of people to test by the Registry), but the payment he made that day violates Registry rules that forbid financial transactions between students and driving schools at test sites because it can lead to the appearance of bias. Both Lortlar-Ünlü’s husband, Selim, and Knott-Craig wrote emails to the Registry and received a prompt reply: A state trooper conducted an investigation that concluded there were mistakes made and confusion on all parties’ parts, but no improprieties found. But Knott-Craig and the Unlus are skeptical of that explanation. "This is clear privileged treatment of those taking the road test through driving schools," Selim Unlu said. Knott-Craig agreed. "For working class families (paying a driving school extra money) is too much" she said. "The time taken off work unpaid, the $35 road test fee, it’s all budgeted for. Paying more is not feasible and frankly, it’s not fair." NECIR intern Rachel Riley contributed to this report. Beth Daley is a reporter at the New England Center for Investigative Reporting, an independent, nonprofit news center based at Boston University and WGBH News. She can be reached bdaley@bu.edu. Follow her on Twitter at @bethbdaley.